The average fees for students joining this course are ranges between INR 8,000 to 3 lakhs per annum. The objective is to provide students opportunities to learn about nutrients in animals and other biological sciences, the application of nutritional sciences to health, the digestive process, and welfare of companion pet animals. This course also focuses on the application of biological and chemical principles and management of animals and production of animal products. This gives instructions in nutrition sciences, biochemistry, animal sciences, food science and technology, hatchery design and related aspects of animal safety and health. The selection of students for admission to this course will be based on marks scored in entrance exam and the marks obtained in their bachelor’s degree. Admission for this programme is based on the all Indian competitive examinations conducted by veterinarian council of India. Students must appear for the written exams conducted by the colleges or universities. This course prepares students to care for, breed, and market livestock and farm animals. Course includes instruction in animal science, animal health, and animal nutrition as applied to various species and breeds. Graduates find employability in academic teaching and research, industrial research, extension education, food and feed industries, and in laboratory research programs. They also work in nutrition industries, private corporations, and pharmaceutical industries. These graduates work as caretakers, animal nutritionist, veterinary assistants, and technicians. The average salary for these professionals per annum ranges between INR 1 to 10 Lacs as per their expertise in this field. M.V.Sc. in Animal Genetics and Breeding: What is it about? M.V.Sc. in Animal Genetics and Breeding course curriculum with animal nutrition students learn a firm background in the biological and natural sciences. This course is essential for understanding the principles of animal nutrition. Students can understand animal nutrition and learn entire scope of animal science. This study also permits students to focus on related disciplines as biology, physiology, genetic engineering, animal behaviour, growth and production, and companion animals. In Dissertation, students should carry out a primary project in an area related to animal nutrition supervised by some nutrition specialist. Case studies should involve dietary evaluations, including formulations on commercial premises, livestock species, and companion animals. They should document the experimental design, data analysis and interpretation, research techniques in animal nutrition, and presenting scientific data. Candidates who have completed Bachelor of Veterinary Science (B.V.Sc.) in any stream of science such as animal nutrition, physiology, anatomy, biochemistry, bacteriology, genetics, microbiology, animal breeding, virology etc. with minimum of 55% marks or 6.0 CGPA in 10 point scale can apply for this course. Students should attend and clear this exam with maximum cut off marks. Based on this entrance exam marks and their degree marks, students are admitted to this course. Dairy research institutes also require the services of veterinarians. Private practices of vets can flourish very well in urban areas.Postgraduates in veterinary science can go in for further research and development in this sector. Veterinarians work in private clinics, animal hospitals and laboratories. Their starting pay scale ranges between INR10, 000 – 15, 000 per month. 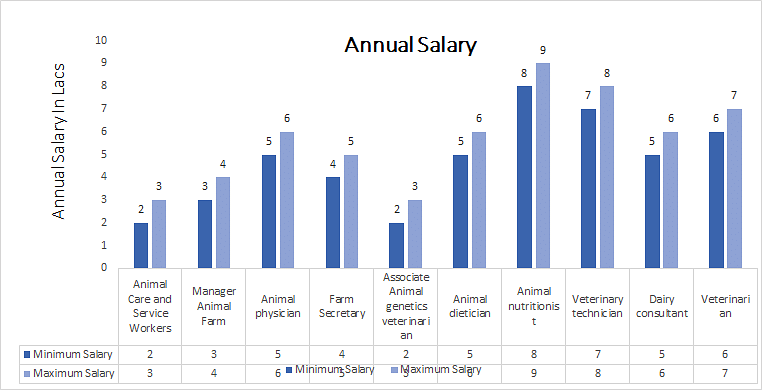 It is also likely that this trend will open up careers in veterinary medicine, especially for job seekers who have skills in both molecular genetics and bioinformatics and an interest in using these talents to address animal health-related problems. Also, one may start own clinic and start practice, for example- pet care clinic. Graduates may work as research professionals in the field of Animal health and medicines. Generally it covers the study of animal physiology, handling and avoidance of diseases among them. The very principle of Veterinary science is similar to that of human medical sciences. But on the other hand the job profile is a bit different when compared to a physician or a surgeon in particular. In government sectors, graduates work with regulations governing agricultural industry, or work directly in research. Colleges and other educational organizations employ persons with advanced training as laboratory scientists, researchers, teachers, and extension specialists. These graduates also work in professional teaching positions, area livestock specialists, and agricultural agents.